Right now, Amazon has the Indiana Jones: The Complete Adventures Blu-ray box set for $34.99 (that’s 54% off the list price of $75.99). 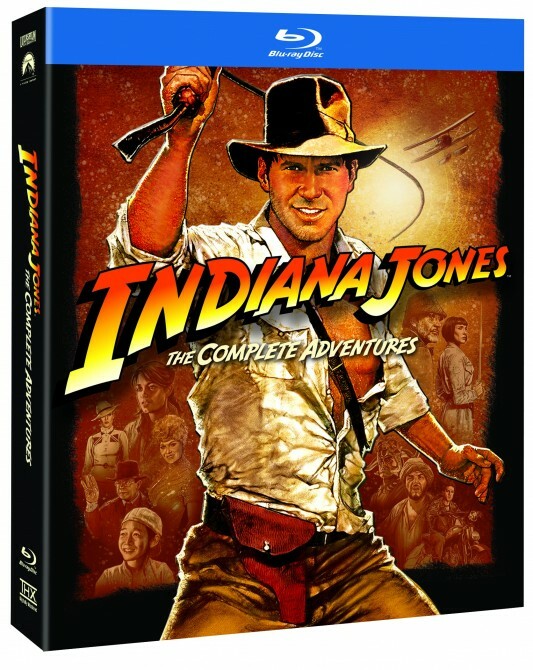 This Blu-ray box set contains all four movies starring Harrison Ford as the title adventurer Indiana Jones, along with seven hours of special features like documentaries, interviews, featurettes, and all-new bonus features. Grab this item while it’s on sale and be sure to visit the MAIN SALE PAGE for more deals. Blu-ray Deal: Indiana Jones: The Complete Adventures For $30! The Gold Box spotlight deal of the day over at Amazon today is the Indiana Jones: The Complete Adventures Blu-ray box set for $29.99 (that’s 61% off the list price of $76.99). Back in the early 1980s, the PG-13 movie rating had yet to be created. So, when making a film like Raiders Of The Lost Ark, director Steven Spielberg had to curb the violence and bloodshed to get a PG rating from the Motion Picture Association Of America (MPAA), including in the climatic end sequence where Belloq’s head explodes. 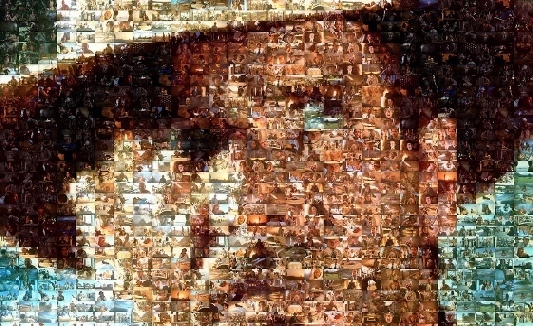 Now, an unearthed image from the film shows what the exploding head looked before flames were superimposed over the scene in this first installment of the Indiana Jones film franchise. Check it out here below. The Gold Box spotlight deal of the day over at Amazon today is the Indiana Jones: The Complete Adventures for $38.99 (that’s 61 % off the list price of $99.99). A Tumblr blog entitled Cinephilia & Beyondhas uncovered a very interesting piece of movie memorabilia that fans of the Indiana Jones films will find very interesting: original pages from what looks to be a fifth draft screenplay for Raiders of the Lost Ark written by Lawrence Kasdan, complete with handwritten notes by star Harrison Ford. You can check out those pages with the notes here below. It is fascinating to see how actors and actresses approach their roles of varying size, be it the lead in a multi-million dollar film or the understudy to the fifth lead in an off-Broadway play. Constantin Stanislavski, the legendary Russian theater actor and director best known for being the grandfather of “Method” acting, once famously said, “There are no small parts, only small actors.” Great performers invest themselves in their characters with true dedication even if they’re only on camera for a brief scene. To celebrate the Blu-ray release of the original three Indiana Jones films, Paramount Studios is releasing Raiders of the Lost Ark in IMAX theaters. Now to make the film’s massive theatrical conversion official, we are getting a trailer for the IMAX release, as well as a nifty hand-drawn poster to celebrate the IMAX release. Check both of them out here below. It’s rare to see a classic film get re-released in major theater chains. But many studios are now commemorating the anniversary of the successful titles in their library by polishing the sound and picture quality and giving them a short theatrical release. Now with the upcoming release of the original three Indiana Jones movies on Blu-Ray this September, Paramount will be releasing Raiders of the Lost Ark in IMAX theaters from September 7 to the 13. ScreenCrush was the first to discover the news of the film’s re-release in IMAX, but Paramount refused to comment on the subject. Still, ticketing sites like Fandango are already posting the film on their schedules for IMAX screens everywhere. Yes this includes the traditional 70mm IMAX screen as well as those fake ones as well. Considering that the film was never shot with 70mm cameras in the first place, this shouldn’t bother the IMAX purists. If adventure has a name it must be Indiana Jones. The legendary film franchise that made Harrison Ford a household name and solidified the reputations of Steven Spielberg and George Lucas as the kings of Hollywood blockbuster filmmaking has been one of the more notable absences from getting the Blu-ray treatment so far, but all that is about to change. The Complete Indiana Jones Blu-ray Collection is finally heading our way courtesy of Lucasfilm Ltd. and Paramount Home Media Distribution. You can watch a trailer for the release here below. The Complete Indiana Jones Blu-ray Collection box set will include all four Indiana Jones movies (yes even Kingdom of the Crystal Skull) remastered in high-definition and featuring a “best of” collection of documentaries, interviews, featurettes, and a few additional bonus features as yet unknown. 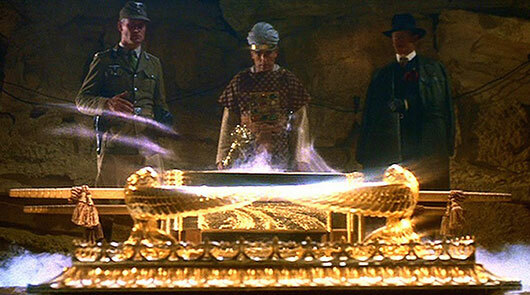 Maybe they’ll finally include those fabled deleted scenes from Raiders of the Lost Ark. Lord knows the Lucasfilm archives are teeming with great material for Blu-ray extras. Lucas didn’t hold out on us (much) when he released the Star Wars Blu-ray set last year. 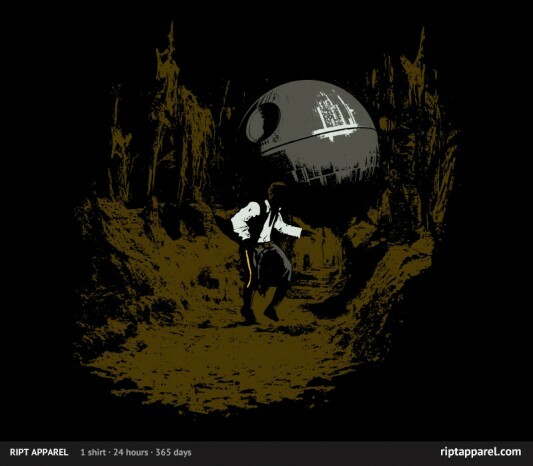 The $10 t-shirt deal of the day over at RIPT Apparel today is a mash-up of Star Wars and Raiders of the Lost Ark called “Raiders of the Galactic Empire” by studown. The sale began at Teefury today, Friday, February 10, 2012, at midnight EST, and will continue for 24 hours from then, and once it’s over, it will not be sold on the site anymore.